The arguments are followed by proposals to proceed with developing and utilizing the technology in ways that are both effective and respectful of individual privacy. The reader of this book will be able to develop an informed opinion as to the usefulness of MVEDRs and thus contribute intelligently to the debate as the United States Congress considers legislation that mandates this technology. In the United States 220,935,000 registered owners of motor vehicles are becoming aware of black box technology through newspaper and magazine articles, and television news stories. Many understand that these boxes already exist in 40 million cars. Yet motorists still have many questions and concerns about widespread use of the technology. 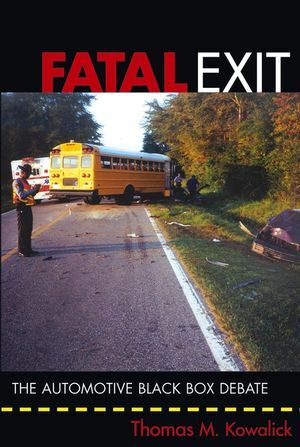 As the only book of its kind, written by an insider and expert on the subject, FATAL EXIT provides an invaluable resource for anyone interested in why these devices have caused such international controversy. Thomas M. Kowalick has been in the center of the international debate over the use of black box technologies for more than seven years. He is the President of Click, Inc.®—Transportation Safety Technologies, a member of the Author's Guild, and is a Professor of History and Holocaust Studies at Sandhills Community College in Pinehurst, North Carolina. He holds three patents related to MVEDRs and is Co-Chair of the IEEE-SA Global Project 1616: Motor Vehicle Event Data Recorder Standard. I. SYMPTOMS OF A PROBLEM. 2 Nothing Happens for the First Time: 1969-1998. 3 Shifting Gears: April 1998-September 2002. 4 NHTSA Call for Comments: October 2002. 5 Things Are Further Away in the Dark: December 2002. 6 Blowin' the Horn: January 2003. 111. SOCIETAL I S S U E S.
7 Cruise Control: February 2003. 8 Turn Signals: February to March 2003. 9 Speed Bumps: March to November 2003. 10 Legal and Privacy Issues: 1999-2004. 11 Pros and Cons and Customers of Safety Data and NHTSA Rulemaking. 12 The Road Ahead: Automotive's Second Century.